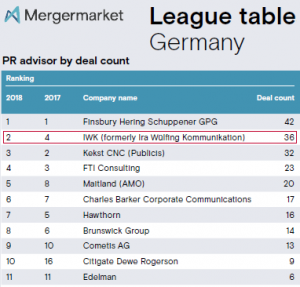 According to the current consulting report of the M&A industry observer Mergermarket for the full year of 2018, IWK Communication Partner (formerly Ira Wülfing Kommunikation) is on the podium of the German PR agencies with the most communicatively supported transactions of the last six months. Accomplishing the best result in the 15-year company history, IWK improved by two places (previous year: rank four) and is thus, as in previous years, the only owner-managed agency in the top group. This underlines the growth course of the company in recent years. During the period under review, IWK and its small but powerful team worked for more than a dozen private equity and venture capital companies as well as M&A consultants, with a focus on small and mid-cap deals. In addition, IWK advises several professional service firms, law firms and medium-sized companies.